Illuminate, Baylor University’s Academic Strategic Plan, has one overarching goal: To bring light to the world as we accelerate our quest toward preeminence as a Christian research university, building on Baylor’s historic strengths and strategically investing in new areas of research and service. In May, 2014, the Baylor University Board of Regents adopted a broad-ranging array of Five-Year Goals for 2014-2018. Constructed around the five high-level Aspirational Statements that represent due north for the University's future course, these Five-Year Goals are a natural outgrowth of the University's continuing implementation of Pro Futuris. With a clear understanding of the desired destination, the University leadership spent months considering the essential steps that must be taken to realize our ambitious vision. That process of collaboration resulted in the creation of a set of highly specific Institutional Acts of Determination reflected in the form of Five-Year Goals. Baylor University remains a place where the Lordship of Jesus Christ is embraced, studied, and celebrated. We love God with our heart, so we are compelled to care for one another and to address the challenges of our hurting world. We love God with our soul, so we are called to worship Him and to serve Him in building His church. We love God with our mind, so we are called to instruction, research, scholarship, and creative endeavors that truth may be discovered and disseminated, beauty revealed, and goodness honored. As articulated in its mission, Baylor endeavors "to educate men and women for worldwide leadership and service by integrating academic excellence and Christian commitment within a caring community" - a mission further illustrated through the University's foundational assumptions, core convictions, and unifying academic themes. These commitments motivated the founding of Baylor in 1845 and have guided the university at every point in its history. 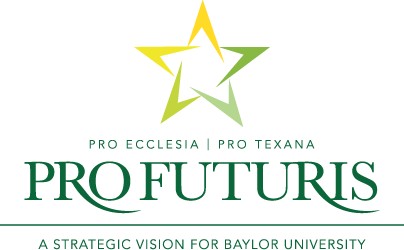 Together with Baylor's motto, Pro Ecclesia, Pro Texana, they continue to define Baylor's exceptional character, purpose, and vocation in the world of higher education. In these Five-Year Goals one finds, as if looking in a mirror, a reflection of the best of one's hopes and dreams for Baylor University at this exciting time in history. The Five-Year Goals bring a higher level of specificity to the vision of Pro Futuris and set clear expectations for the shape of things to come.